Giving birth to a child is widely considered to be one of the most beautiful experiences in the human evolutionary process, but can be one of the most mentally and physically stressful period of a woman’s life. The woman’s body goes through a whole host of changes that can cause quite a substantial amount of discomfort during this phase. The chemical balance within her body is also likely to go haywire during this period – causing a number of the sudden mood swings and cravings that are also seen as a normal symptom of pregnancy. 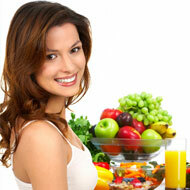 An expecting mother's diet during pregnancy is also a very important aspect of the entire process. What Is A Pregnancy Weekly Diet? How To Prevent Pregnancy Weight Gain? Did You Crave Fruit During Pregnancy? An expecting mother should always keep in mind the fact that whatever she consumes is being fed to the baby as well, via the umbilical cord within her body. Junk food is considered to be amongst the most non beneficial foods to consume during this time because of the fact that they offer a number of empty calories – which are calories with either very little or absolutely no nutrient content. Calories are an essential part of your dietary intake during a pregnancy as you are going to require an increasing amount of energy right through the term. The calories are the primary source of energy as they are broken down within the body to create the required amount. Studies have shown, however, that expecting mothers do not generally increase their intake of food substantially during the first 6 months of the pregnancy, but do so primarily during the last trimester, when the baby begins to develop at an increasingly faster rate. Because of the fact that your diet during pregnancy will significantly impact the child within your womb, it is important to choose your foods carefully. Natural foods like fresh fruit and vegetables are highly beneficial as they provide a large variety and quantity of minerals, fiber and vitamins while milk products like skimmed milk, yogurt and cottage cheese provide the body with the much required quantities of vitamin B 12 ad essential amino acids. While concentrating on your diet for pregnancy, it is also important to keep in mind that keeping yourself significantly hydrated over the course of the day is very important. Make sure that the water you consume is filtered and free of pollutants and contamination. Although fish are a good source of protein, avoid fish that may have unsafe levels of naturally occurring mercury.